The history of Led Zeppelin is the story of one of the most groundbreaking and enduringly popular acts in music. Led Zeppelin is credited as being the godfathers of metal, but their music actually incorporated elements of many different musical styles, including blues, folk, reggae, and world. This line up began performing as The New Yardbirds but soon changed names to Led Zeppelin. Lore surrounding the roots of the name says that the idea of "lead zeppelin" came from John Entwhistle, who tended to refer to bad gigs as "lead balloons," and that the band decided to drop the "a" so Americans wouldn't mispronounce the band's name as "leed" (phonetically). The buzz about Led Zeppelin was there from the beginning. On the recommendation of Dusty Springfield, Led Zeppelin was signed to the highest paid record deal of the time - $200,000 from Atlantic Records. This blues and soul orientated label proved to be the perfect home for the blues inspired rock band. After they got the deal, Zeppelin hit the road almost immediately, building their audience base through live shows in the UK and the U.S. Led Zeppelin's first album - Led Zeppelin I - was released in 1969 to much fawning critical fanafare. They released the second album, Led Zeppelin II, less than a year later. This album was just as well received critically and solidified Zeppelin as major players with fans as well. Led Zeppelin II was the band's first number one hit. Led Zeppelin III, released again less than a year after Led Zeppelin II, was a departure from the first two albums. Recorded in a small studio in Bron-Y-Aur, Wales (hence the album track Bron-Y-Aur Stomp), Led Zeppelin III is an altogether more acoustic and folky affair than the previous two albums. To the band's chagrin, Atlantic chose to release Immigration Song, the hardest rocker on the album, as the single, obscuring the overall nature of the album, and it took fans and critics a while to adjust to this new Zeppelin sound. Led Zeppelin III was still a success, but it has been hailed much more in retrospect than it was at the time. The climax of Led Zeppelin's success came with their fourth album, released in 1971. Though the album is technically unnamed, it is usually referred to as Led Zeppelin IV (some people also call is "Zoso," a phonetic reading of the mystical symbols used on the cover). 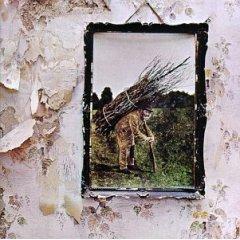 This album catapulted Led Zeppelin to superstar status. Stairway to Heaven, the best known Zeppelin song, is on this album (oddly enough, this song was never a single), and other popular Zeppelin songs, like Black Dog, Going to California, and Rock'n'Roll. Led Zeppelin IV is one of the most influential albums ever made; it is constantly rediscovered by new generations and is required listening for any music fan. In the wake of IV, Led Zeppelin's star went nowhere but up. These later albums are not as popular with modern fans, but they were overwhelmingly popular at the time. Physical Graffiti and Houses of the Holy each broke sales records, and on the Houses of the Holy US tour, Led Zeppelin broke attendance records set by the Beatles. With success came trouble, however. During this period, drug and alcohol abuse began to take its toll on this notoriously hard partying band. The band also longed for a break from the road. In 1977, they hung up their instruments to take a breather. In 1980, the band came back together to record a new album. On his way to a rehearsal, drummer Bonham stopped off for 16 shots of vodka. He drank throughout the rehearsal. Bonham went to bed that night and never woke up again - he vomited during the night and choked. He was dead at the age of 32 and the band called it quits for good. Plant and Page have stayed active in musical projects, both together and apart, in the years since Bonham's death. The two musicians had a falling out with Jones in the early 1990s, which kept him out of recording and shows. In 2007, however, the feud was put aside, and it was announced that the band would perform for a benefit for the Ahmet Ertegun in November 2007. Filling in for Bonham on drums is his son, Jason.